Welcome to your guide to choosing and changing Medicare supplemental insurance plans. We’re located in St. Louis, MO, just outside of St. Charles and licensed in 48 states. Regardless of where you live, this guide will help you! If you landed here it’s because you’re likely looking for information to learn how to choose the best Medicare supplemental insurance plan that is competitive in your area, regardless of the state you live in. I’ll use some examples through out from Missouri because it’s where I’m from, but we have licensed agents in every state to help you navigate this process. We understand your pain, the only thing in abundance during your hunt for Medicare supplemental insurance is a bunch of direct mail and sales pitches. Rarely can you find somebody willing to take the time to educate you on the critical decision factors you should consider before enrolling in a Medicare Supplement or Medicare Advantage plan. Seniors tell us all the time that they feel invisible when they reach Medicare age because it’s so difficult to find the right person and resources to learn what they should or shouldn’t be doing. I’m going to share some simple concepts you should know about choosing Medicare supplemental insurance as well as address some common questions. After reading this guide in full you will have a much stronger understanding of the questions you should be asking, what your agent should be telling you, and the types of plans that may be best fit for your situation. A Rated Medicare Supplement insurance plans. What is the best Medicare Supplement plan in St. Louis for 2019? Most common Medicare Supplement plans and the differences. How to predict when Medicare Supplement plans will have rate increases. Switching Medicare Supplement plans outside of the Annual Election Period. Centers for Medicare & Medicaid Services (CMS) has announced Medicare Advantage and Part D 2019 Rate Announcement and Call Letter. This is the last update on policy changes for the upcoming 2019 calendar year. Here is the full report on the upcoming Medicare changes in 2019. What are the options when I become eligible for Medicare? There are 3 main options, 2 we suggest and 1 we definitely advise against. Medicare Supplement (Medigap) and a Part D. This is a very common solution for those looking to close the 20% gap from original Medicare. Medicare supplements are standardized plans which means every plan must offer the same benefits. For example, a plan F from AARP is the same as a Mutual of Omaha Medicare supplement plan F. This option is for those who want to have the peace of mind they will not have to worry about copays for every visit and procedure. In most cases all of your copays and coinsurance are covered when using a Medicare supplement and Part D drug plan. It’s a very predictable way to manage your monthly expenses. Medicare Advantage Plan. Medicare Advantage is a program offered by private companies such as United Health Care, Aetna, Humana, and many others. These plans require you to have Part A and Part B to enroll and each have a copay schedule for your doctors and hospital visits as well as some added benefits such as dental, vision, hearing, and wellness. These plans are typically an HMO or PPO which is a form of doctor network that you must remain in network to receive in network benefits. Many of the Medicare Advantage plans are zero premium which means you only pay when you’re using the plan. Original Medicare only: This is option is extremely risky. When you’re on original Medicare only (Part A and Part B), you are subject to 20% plus deductibles with no cap on your payments. This is why it’s wise to choose 1 of 2 options listed above to help mitigate your risk of the 20% and the deductibles. Rarely do folks we meet with only have original Medicare, but it’s certainly happened and they are much better off after being educated on what they may qualify for in terms of supplemental coverage. We’ll go into more detail through out the guide, but this should give you a good idea of the basic options you have to protect yourself from the 20% gap and deductibles of original Medicare. First thing you need to know is that Medicare supplement plans are also called Medigap plans. Yes, two names for the same thing. If someone refers to a Medicare Supplement Plan F or a Medigap Plan F, it’s the same exact thing. Original Medicare covers 80% after deductibles have been met which creates the need to Part D and Medicare supplemental insurance to fill the remaining coverage gap. Technically speaking, this means Medicare part a b d are the basics and the supplement covers the 20% liability. Medicare Supplement Insurance plans are provided by private insurance companies that coordinate with benefits provided by Original Medicare. This is the most common way most people eligible for Medicare satisfy their supplemental health insurance needs. Medicare Supplement plans fill the gap which Original Medicare doesn’t cover, including deductibles. Below are some of the common questions clients ask us about Medicare Supplement plans. The key in choosing the best Medicare Supplement plan is understanding the plan differences. Medicare Supplement plans are standardized and identified by letters A through N. This means each plan of the same type (for example, Plan N), must offer the same exact benefits. The only difference is the price. What are the Most Common Medicare Supplement Insurance Plans? While there are many types of standardized plans, there are three common Medicare supplement plans that make up the lions share of active policies. Below are the three most common medigap plans you should review before making your decision. Plan F is the most comprehensive Medicare supplemental insurance plan available. However, it is scheduled to discontinue in 2020. This means if you’re turning 65 in 2020, the plan F will no longer be available to purchase. If you already have a plan F, you will be able to keep your plan F, so there is no reason to worry about losing it. Why choose Medicare Supplement Plan F? This plan is fully loaded and a great option for those who want coverage to satisfy the 20% liability of Original Medicare. Plan F benefits include the following. Plan G is an excellent choice for Medicare supplemental coverage and is very similar to plan F mentioned above. The biggest difference between a Plan F and Plan G is that Plan G Medicare supplements do not cover your Part B Medicare deductible, which is only $183. The reason why people commonly choose a plan G is that the monthly premiums savings between a Plan F and Plan G is greater than paying the annual Part B deductible. For example, if you are 65 and live in St. Charles or St. Peters, a Plan F Medicare Supplement will cost you roughly $170 per month with Transamerica while a Plan G would cost you $130. Would you agree it’s worth paying the $183 Part B deductible in order to save $300 on your Medicare supplemental premiums? Why choose Plan N over Plan G? The reason some people choose a plan N is because they will try to forecast our their doctor visits for the year to determine if it makes sense to choose a lower premium plan. Let’s use the example listed above for a 65 year old living in St. Charles, MO. You can get a plan F for $170 from Transamerica or you can get a Plan N for $113 from Pekin Life Insurance Company. Put yourself in this hypothetical client’s shoes. Would you be willing to potentially have the costs associated with a Plan N if you knew it might save you nearly $700 per year in Medicare Supplement premium costs? As you can see, the differences in Medicare Supplement plans are negligible and based on your current health history, you can choose the best Medicare Supplement plan that fits your lifestyle. You just have to take the time to understand the moving parts and whether or not they will financially impact you. There are two ways to sign up for a Part D Prescription Drug coverage plan: by enrolling in a standalone Part D plan (PDP) or by enrolling in a Medicare Advantage with Prescription Drug coverage. Most Medicare Advantage plans include part D coverage. If you are purchasing a Medicare Supplement, then you need to make sure an also purchase a Part D drug plan. If you are already enrolled in either Medicare part A or Medicare part B, you are eligible for a standalone Prescription Drug Plan. If you don’t elect a drug plan during your eligibility period, you will be subject to a monthly penalty. The best way to get a Medicare Part D plan is by using the Medicare Part D plan finder on Medicare’s website. There you will enter your drug information and find the best plan that fits your situation. It’s extremely important that you go through this process to best determine the plan that is going to be more comprehensive in coverage and cost effective. This is one of the most common questions we hear when talking to individuals and families about their Medicare supplement. St. Charles and St. Louis have very competitive options, which makes our job as Medicare brokers easy. The best answer to this question is to remember that all Medicare Supplement plans are standardized. What does it mean that all Medicare Supplement plans are standardized? Regardless of the company, all plans must offer the same benefits. For example, a Medicare Plan F with Transamerica by law must offer the same benefits as a Plan F from AARP Medicare supplemental insurance. The only difference is the price you pay each month. This should give you the confidence that regardless of the type of Plan F, Plan G or Plan N you choose, all the benefits and available doctors will be the same. In case you were wondering, Plan F prices for a 65-year old individual in St. Louis range from $158 all the way up to $358. It should be noted that all plans should be considered on a case-by-case basis to ensure you are properly educated on the best plan for you. How to choose Medicare Supplement plans when monthly premiums are drastically different? You definitely can take some steps when shopping for a Medicare Supplement that will help you avoid getting a surprise rate increase the following year. The best way to determine which Medicare plan to go with is by analyzing two additional key factors now that you have made your decision on the plan type you want to go with. After you have chosen your plan, the second step is reviewing historical premium increase trends. Since you now know the plans are standardized, you know the benefits aren’t up for debate. It’s now all about price. You should look at the last 3, 5 or 10 years of data and see how much premiums have increase year over year. If the agent you are working with isn’t explaining this to you, then you should seek out a second opinion as this information is readily available. Insurance company loss ratios are extremely important when looking at plans and predicting rate increases for the follow years. The third step in choosing your Medicare supplemental insurance plan is by reviewing the insurance company loss ratios. This is important as it will help you understand which plans are likely to experience a higher than average rate increase. For example, AARP Medicare supplemental insurance plans in St. Louis have average a 2.1% rate increase over the last 6 years and historically maintain an 80% loss ratio which is considered acceptable. This means their risk pool isn’t completely filled with unhealthy members, which keeps their claims within acceptable ranges. The better a company can control their risk pool (annual claims), the more money they can keep in their reserves and the more stable they will keep your premiums year over year. One of the common misconceptions about Medicare Supplements is that you can only switch your plan during the Medicare Annual Election Period (AEP). This time frame occurs every year from October 15th-December 7th. Medicare Supplement enrollments are not tied to Medicare’s annual election period. The only plans that are mandated to be changed (if you choose to change) during the Annual Election Period are Medicare Advantage Plans (MA-PD) and Medicare Part D prescription drug plans. Medicare Supplements are not under those same rules and can be changed throughout the year. Below are the two common scenarios that impact your ability to switch your Medicare Supplement plan. Missouri is one of the few states that allows you to change your Medicare supplement plan with out additional underwriting, but only during a select time through out the year. If you are within 30 days before or after your current Medicare Supplement anniversary period you can switch your plan without having to go through any underwriting questions. This is a unique rule to the state of MO. This means that regardless of your health, if your premiums increase on your Medicare Supplement plan and you are a resident of the state of MO, you can switch to a lower cost plan with the same benefits without being penalized for pre-existing conditions. MO is one of the only states that offers this benefit to Medicare Supplement policy holders. For example, if your Plan F policy anniversary date is October 1st, that means you can switch your Medicare supplement to another Plan F from September 1st through November 1st regardless of your health. California and Oregon have similar rules commonly referred to as the birthday rule vs. the anniversary period. The other scenario for switching your Medicare Supplement plan is when you’re outside of your anniversary period. You can still switch, but you will have to complete the health questions again. Most people who live in St. Louis make it a habit to review their Medicare supplemental insurance every year around their anniversary period to make sure they are in the most cost effective and financially stable option. If you do this year over year, you can be sure you will not over spend on your Medicare supplemental insurance plan. How Can I Compare Medicare Supplement Plans? The best way to compare medicare supplemental insurance plans is by working with an independent agent. The reason why is because an independent agent doesn’t have an exclusive agreement with any specific insurance company. This means they can shop the market for you and show you the price variations, financial ratings and claims history. For example, the cheapest medicare supplement plan F in St. Louis is $158 and the most expensive Medicare supplement plan F in St. Louis is $385. The least expensive company hasn’t yet been rated by AM Best and the most expensive plan is B rated. If all plans offer the same benefits, does it make sense to pay an additional $227 per month for your Medicare supplement plan? NO. Now this may be a lot of work to properly review, but we highly suggest you take the time to review the best medicare supplements plans by working with an independent agent. What if I Want to Cancel My Medicare Supplement? Cancelling your medicare supplement is possible, but can come with some challenges. You should definitely speak with someone before cancelling so you’re not put into a tough situation. Below are a couple scenarios you should consider before making any decision to cancel your plan. It’s June (outside of annual enrollment) and you decide you want to cancel your medicare supplement. You can certainly do that as long as you’re healthy enough to go through underwriting again (answer all the health questions). This is pretty straight forward and not really an issue and happens all the time. We most often find people cancelling their medicare supplemental insurance because they found another plan which offers the same benefits for a lower price. Now, here’s where things get a little tricky, and you need to pay attention. Earlier we talked about the annual enrollment period which happens between October 15th and December 7th. If you decide you want to cancel your medicare supplemental insurance plan outside of the annual enrollment period, you are going to put yourself in a bad position. Your medicare supplement isn’t mandated to follow the CMS enrollment guidelines, but your Medicare Part D prescription drug plan is. 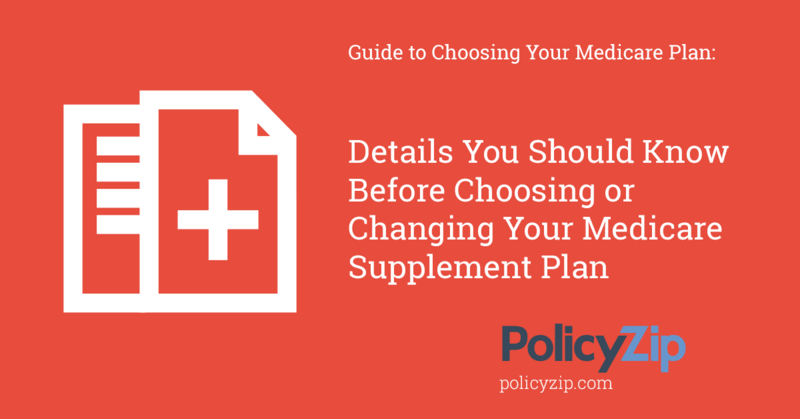 This means that if you cancel your supplement plan, you will only be left with drug coverage and original Medicare (20% liability of all costs plus Part A and Part B deductibles). Because Part D drugs plans follow CMS enrollment guidelines, you cannot switch it until the next AEP. The only way to get into a Medicare Advantage plan outside of open enrollment and after cancelling your Medicare supplement is to qualify for a special election period (SEP). Can you cancel your medicare supplement plan? Yes. Can you get into a new plan? Yes. There are plenty of people willing to talk through your scenario and help you make the right decision. If My Health Changes, What Medicare Supplement Plan Do I Need? The good news about your Medicare supplement plan is that when your health changes, they cannot individually raise your rates. What you need to consider is choosing the right Medicare Supplement plan when you are still healthy so you’re not put in a bad position if your health changes. As we mentioned above, the most common medicare supplemental insurance plans are the followings. Choosing one of these plans will put you in a position that you will not need to change your plan if your health takes a turn. Each of these plans will provide you a strong level of financial security in regards to your healthcare expenses. In order to answer this questions, we ran a review of the medicare supplement plans across all the zip codes in St. Louis utilizing current 2018 data from CSG actuarial. If a company is listed in both categories below, there is a strong indication it’s a Medicare supplement plan you should consider. Plans highlighted green are a good place to start when you are considering choosing or changing your medicare supplement plan in St. Louis. Below you’ll find the results by financial rating and price. Best rated Medicare supplement plans in St. Louis. Who are the Top 10 Rated Medicare Supplement Carriers for 2019? In order to look at the top rated Medicare supplement plans for 2019, we again used data from CSG actuarial, the leading actuarial company in the Medicare space. We wanted to list 10, but we believe there are seven superior medicare supplements for 2019 and have listed those below. Combined is an A+ rated company by AM Best and has a positive outlook. This means not only are they financially stable, but they have maintained a strong claims ratio which is a good indicator they won’t have large rate increases in 2019. Their average rate increase is 4%. Mutual of Omaha is arguably the most recognized household name in the Medicare Supplement business. They have an A+ rating and their outlook is “Stable”. Again, this is an indication of strong financial strength as well as good claims management to keep strong claims ratios. They offer a 12% household discount as well which is another perk. AM Best reconfirmed a A+ rating and “stable outlook” for United American. This is a testament to their dedication to continually leading the industry as one of the best medicare supplement plans in 2019. With an average rate increase of 2.5%, there is a strong chance you can expect this to continue in 2019. For the record, they just release their rate increase of 1% for 2018, so the pattern is looking good for United American in 2019. AM Best awarded Americo with an A rating and “stable” outlook, but have not yet released information for 2019 or their rate increase history. They entered the medicare supplement market as a new plan 3 years ago, so the data is still coming in. However, their A rating and stable outlook earned them a spot on our list of best medicare supplement companies for 2018. Cigna is also one of the cheapest medicare supplement plans in St. Louis as well as many other cities and states. Renaissance is a new player to the Medicare supplement market, but they are getting some attention. They have an A rating and “stable” outlook from AM Best. As they are a new medicare supplement plan, we were not able to access rate increase history, but will update as that information is available. You’re not American if you haven’t received information on AARP. They continue to be a leader in the Medicare supplement market and are equipped with a stable A rating from AM Best. With an average rate increase of 2.8%, they are a clear shoe in to our list of the best medicare supplement companies for 2018. If you’re curious about other Medicare Supplement plans in 2018 and want our opinion, just ask we’ll happily pull the data and share with you. We want to make sure you are equipped with the best information when shopping for a medicare Supplemental insurance plan. Can Medicare Supplement Insurance Be Denied? Yes, you can be denied medicare supplement insurance, but only in one scenario. When you first age into medicare, you have a 7 month window to choose your Medicare Supplement plan in what’s referred to as a “guaranteed issue” period. This means that regardless of your health, you will be accepted into the medicare supplement plan of your choice. The most common reason people are denied coverage for Medicare Supplements is when their health has deteriorated and they live in a state that doesn’t allow them to switch to a new plan. This is why it’s critical to do your homework ahead of time and choose a medicare supplement plan that has a strong history of stable rate increases and claims ratios. This will give you the best chance at not needing to switch your supplement due to price down the road. Does Medicare Supplemental Insurance Cover Dental or Hearing Aids? No, Medicare supplements do not include dental insurance or coverage for hearing aids. In order to get this coverage, you must get a third party plan. These plans can be stand alone senior dental insurance or senior hearing plans, or you can get combination plans referred to as Dental, Vision, and Hearing (DVH). Dental, vision, and hearing plans are often very affordable and while not as robust as what you may be used to before going on medicare, they can drastically impact the costs of dental work or hearing aids. One of the most well known dental, vision, and hearing plans is offered through a company call Medico. If you would like information, shoot us an email and we can certainly talk through you options. Can I Get a Supplement That is Tax Deductible? Yes, you can deduct your medicare supplement premiums that exceed a certain percentage of your AGI. You should speak with your tax advisor on how to report your medicare supplemental insurance premiums as a deduction on your tax return. As previously discussed, Medicare Supplements have a monthly premium, so it’s important to weigh your options when considering which medicare supplemental insurance plan to choose. Below are two low income scenarios. If you’re classified in your state as “low income”, then you may qualify for some level of Medicaid. When this happens, it likely makes more sense to utilize a Medicare Advantage plan that coordinates with Medicaid. These plans are called Dual Special Needs Plan (DSNPs). This means the Medicare plan is designed for people with Medicaid and will coordinate with their services. One of the reasons low income individuals on Medicare use dual special needs plans is to take advantage of the additional benefits not offered through Medicare or Medicaid such as hearing aids, silver sneakers, and some limited dental work. Low income doesn’t always mean Medicaid, but may just mean you’re retired and living on a fixed income. This scenario certainly creates the instance where you need to be cost conscious with your healthcare plan. Medicare supplements carry a monthly premium, so you need to consider how much you’ll need to use your coverage. If you anticipate a significant amount of doctors visits and copays, you might find the monthly premium of a medicare supplement worth it due to the savings of copays and deductibles. Remember, Medicare supplement plans can cover up to all the benefits listed below. This is a sticky subject for individuals who are disabled, eligible for Medicare (after 24 months of disability), and under the age of 65. Many Medicare supplemental insurance companies do not offer plans for individuals under 65. If you’re on Medicare and under the age of 65, it’s strictly because you’re on disability. In the eyes of the insurance company, that means adding you to their portfolio of products will result in a higher amount of claims. If you’re disabled and looking to get a Medicare Supplement plan, you should definitely speak with an agent who can shop the medicare supplement plans in your state to get paired with the right plan. As we stated at the beginning, Medicare supplements are standardized and plans of the same type must by law offer the same exact benefits. The only difference is the price you pay each month. For example, a Medicare supplement plan g with AARP offers the same exact benefits as a Medicare supplement plan g with Transamerica, the only difference is the price. Below is are example plan G rates of a female turning 65. For this example I used the state of MO, but this should give you a good idea of what to expect in your area. You can always contact us and we can run a full report for you. Choose a Medicare Supplement plan A-N based on what fits you best. Remember, the most common Medicare Supplement plans are Plan F, Plan G, and Plan N.
Annually review your plan within the 60-day window of your anniversary period to take advantage of the guaranteed issue period should you need to make a change. If you take the time to analyze your options, you’ll feel much better about the decision you make. Any independent agent can access this information, so you need to press them to show you the data behind the company they are proposing. It’s the only way you’ll truly know you are choosing the best Medicare Supplemental insurance plan for you. If you would like to discuss your Medicare supplemental insurance plans, please call at 888-211-5685 or contact us via email. We look forward to helping you navigate your options and make an educated and confident decision for your Medicare Supplement. PolicyZip is located in St. Louis, MO and serves the greater area with licensed agents available to meet face-to-face. We are a life insurance and Medicare Insurance Agency. St. Charles, Jefferson, Pike, and St. Louis counties are among the core areas we serve. For those looking for Medicare supplemental insurance online or in any state, we have a call center staffed with nationally licensed agents qualified to educate you on your options. One of the best reasons to work with PolicyZip is that we make shopping for your medicare supplemental insurance easy.